Wearable technologies have greatly advanced in recent years. Following this trend, apparel has also experienced novel strides both in materials and concept. As the new era of apparel is ushered in, companies are performing significant research and development related to apparel innovation. Federal and state R&D tax credits are available to help support these industry efforts. 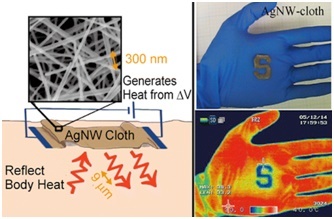 Stanford University researchers, led by Professor Yi Cui have developed a unique new material equipped with silver nanowire fibers designed to reflect the body’s natural heat and increase warmth. 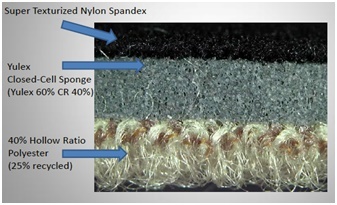 By utilizing ordinary cotton coated with microscopic silver nanowires (AgNW), the material can trap up to 80% of body heat while maintaining a lightweight, breathable design. Researchers from the university developed the material with silver nanowires because of its ability to reflect infrared radiation back to the body. Simply by adding 0.9 volts of electricity, the material can reach nearly 104 degrees Fahrenheit and even be used as an electric blanket. The development of novel uses for silver nanowire also extends to insulating buildings and reducing global energy usage. Based in Baltimore, MD, Under Armour has an increased focus on research and development. CEO, Kevin Plank, says that the company has gone from employing no engineers to having 100 on staff in the past year. Under Armour is looking to attract even more tech talent as retail and tech are becoming increasingly intertwined. The company has seen 31% revenue growth as compared to the prior year, apparel sales have climbed 30% to $707.7 million, and footwear revenue has increased 55% to $85.8 million. 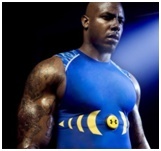 The E39 Compression shirt is just one of Under Armour’s apparel advancements. The E39 is equipped with sensors that track the wearer’s biometrics such as heart rate, breathing rate, lung capacity, acceleration, body positioning, and motion. With an accelerometer, microprocessor, and built-in storage, the E39 can connect wirelessly to smartphones, tablets, and computers. 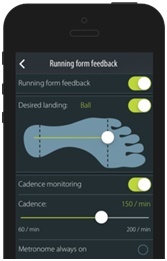 At a 2014 event, Under Armour searched for engineers and software developers involved in wearables, wireless, and apparel based embedded technology to help athletes in fitness assessment, training, recovery, and sleep analysis. In addition to advancements in apparel, Under Armour is working on developing a stronger online presence. In recent years, Under Armour has acquired the online fitness trackers MapMyFitness, Endomondo (European-based), and most recently, MyFitnessPal. With the newest acquisition, MyFitnessPal, Under Armour has reached 120 million fitness app users. The company is working to develop UA Record, a dashboard ecosystem which will integrate all of their digital apps and “provide unparalleled data” says CEO Plank. UA Record will be the largest digital health and fitness community to date. 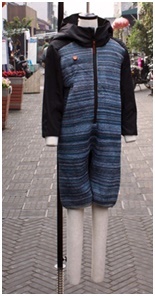 Created by Borre Akkersdijk, the BB.Suit is a novel development that brings a new meaning to wearables. Microprocessors and conductive copper yarn woven into the fabric make this suit a GPS-trackable, mobile Wi-Fi hot spot. Additional features include sensors that detect pollution and clean the air around the person wearing it. Utilizing 3D knitting machines, Akkersdijk threaded together the materials which then debuted at 2014’s South by Southwest Interactive and Beijing Design Week. In addition, Akkersdijk and his research team are testing fiberglass yarn for increased connectivity and developing an open-source platform to communicate with app and microchip developers. “When you have a software designer at his computer and there is a knitting machine behind him, you get unexpected crossovers”, says Akkersdijk, “That’s what we’re trying to create”. Patagonia, based in Ventura, CA, is also investing in the new generation of materials. The outdoor apparel company began looking for alternatives to using neoprene which was highly toxic and not eco-friendly. Partnering with Yulex, an Arizona-based biorubber supplier, Patagonia was able to incorporate latex-free rubber into their plant-based wetsuit which uses a desert shrub native to the southwestern U.S., the guayule plant. The Nexkin® technology wetsuit has improved elasticity, durability, and softness as compared to traditional neoprene suits and has a much lower environmental impact. Skinteractive Studios works with wearable designs that try to bridge the gap between tech and fashion and focus on more practical themes. Biomedia designer and Skinteractive founder, Amanda Parkes, has developed apparel innovations like a piezoelectric dress which uses the wearer’s movement to charge batteries, a solar bikini that charges a cell phone, a thermochromatic paint dress that changers color as the wearer walks, a leather jacket made from Kombucha, and a bra that responds to body heat to mold to a woman’s shape eliminating the need for underwire. Fittersift, based in New York City’s Garment District, has developed a men’s dress shirt that uses “responsive textile technology” to convert unused body heat into infrared energy. 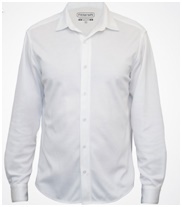 The infrared energy created by the dress shirt could lead to increased blood oxygen levels, improved circulation, and improved body temperature regulation. Each shirt utilizes 13 thermoreactive minerals that work to convert our body heat into useful energy. Additional features of this American-made shirt include wicking away sweat and controlling odors. The moisture-wicking technology uses a blend of hydrophilic and hydrophobic fibers to keep the body dry. The odor control technology utilizes Polygiene, a silver salt (silver chloride) antimicrobial made from recycled silver. The new “Incredible” sports bra from Victoria’s Secret is designed for high-impact exercises providing maximum support and detachable electrodes that integrate with heart-rate monitors. The sensors are located directly on the bra’s brand so no additional belts or strap attachments are required. The sweat-wicking, breathable padded bra is also machine washable. Microsoft is working to develop a sensor-equipped bra that monitors mood and stress levels. The bra integrates with a mobile app and can alert the wearer when their mood changes. Based in Washington, and co-founded by a former Microsoft Executive, Sensoria Fitness offers a variety of advanced apparel including smart socks, wearable anklets, sports bras, and heart rate t-shirts as well as an app to sync your data with. Sensoria’s smart sock is equipped with textile sensors to detect foot pressure, conductive fibers to relay data collection to the anklet, and a magnetic attachment to easily connect to the anklet. Symantec, known for its Norton antivirus and spyware products, has partnered with online retailer, Betabrand, to develop an RFID-proof pair of jeans to protect against personal data skimming. Over 10 million identities are stolen every year and an estimated 70% of all credit cards are vulnerable to credit card skimming. Norton’s READY jeans are designed with a silver-based material to block signals given off by credit cards, passports, and other RFID tagged products. The apparel innovations discussed above are just some of the examples of how previously developed wearables are being integrated into everyday apparel. Concepts such as smart glasses, brain-sensing technologies, smart watches, exoskeleton wearables, and smart helmets, have laid the foundation for larger technology integration within the apparel industry. 3D printing also plays a large role in the advanced apparel industry. The increased design and manufacturing capabilities that accompany 3D printing have allowed the apparel and fashion sector to branch out into new territories. 3D printing has particularly influenced shoe design, accessory, and other apparel areas in which traditional materials are combined with 3D printed materials for a hybrid design. Footwear company, Delcam CRISPIN, uses the hybrid method and design software to customize their footwear for increased comfort. One Delcam CRISPIN design involves half leather and half 3D printed shoes. As the fashion, technology, media, and other industries have expanded, the financial services industry has contracted, prompting many fashion and apparel companies to locate to lower Manhattan and fill this gap. Companies like OSP Group, Brooks Brothers, Revlon, and Vogue have recently made the move to downtown Manhattan, “We realized this is where fashion is headed”, says president of OSP Group, Stephanie Sobel. The apparel industry is primed for larger technology integrations. As novel ideas continue to develop, issues arise such as machine washability, durability, and comfort. Companies working to advance today’s apparel and overcome these issues with innovation can be eligible to receive federal and state R&D tax credits.